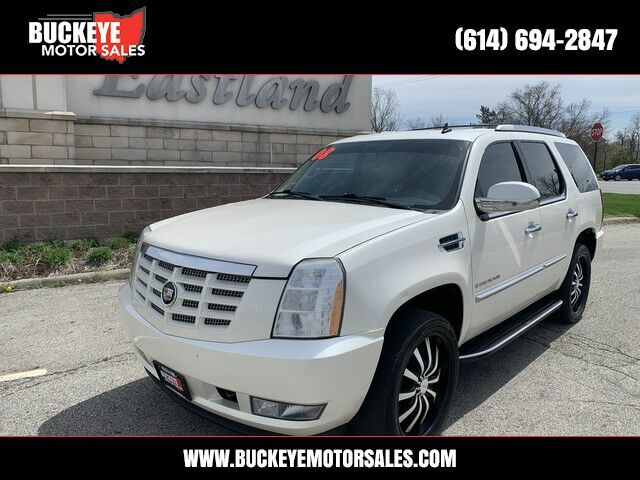 This outstanding example of a 2008 Cadillac Escalade AWD V8 is offered by Buckeye Motor Sales. Your buying risks are reduced thanks to a CARFAX BuyBack Guarantee. This Cadillac Escalade AWD V8 defines excellence in an SUV. It has the convenience of limitless boundaries paired with city sophistication. Sophistication & understated luxury comes standard on this Cadillac Escalade AWD V8. Well-known by many, the Escalade has become a household name in the realm of quality and prestige. All-wheel drive means peace of mind all the time. This White Diamond Tricoat AWD Cadillac enjoys a host offeatures, including exceptional acceleration and superior stability so you can drive with confidence. Let's be honest, not everyone wants to set a course blindly into the dark. For those of us that don't, there are vehicles like this with stellar navigation systems. This highly refined Cadillac Escalade comes with exciting features you'd expect in a vehicle twice the price. The 2008 Cadillac Escalade stands out from its competitors with its powerful, 403-horsepower engine, plush interior appointments and entertainment options, and an interior design that is possibly the most opulent of any American-produced vehicle. The EXT also offers more luxury and comfort features, and makes more of a style statement, than nearly any other pickup truck available.